On the night of the opening of the world’s tallest skyscraper – San Francisco’s elite all on the top floor at the party – a fire breaks out because of the shortcuts taken in the wiring. The principled architect (Paul Newman) and the brave fire chief (Steve McQueen) fight to get everyone out alive. It’s an all star-cast blockbuster from 1974, and it runs a marathonic 160 minutes or so. 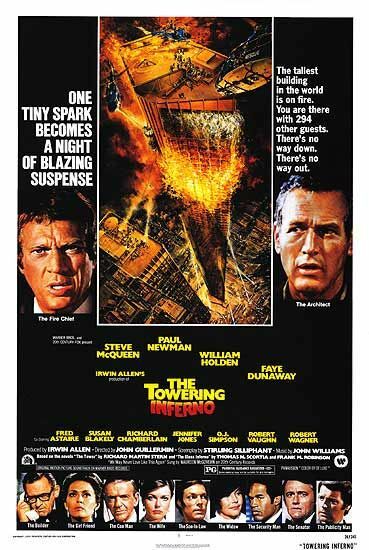 The first time I started watching The Towering Inferno, I was about eleven and staying at my grandparents’ house. I used to love sleeping in their spare room, with the foldout couch and the television. (It seemed the ultimate decadence, to have a television in one’s room.) The movie was on commerical television and I came in late; one of the first things I saw was a couple catching on fire and falling through a window sixty floors up. I was hooked. For the next couple of hours, I fought against tiredness as the increasing commercials bloated its length. I didn’t make it through. I had to sleep. I got it out on video in 2003, when I was living in the decaying sharehouse with my brother. About halfway through, the dodgy VCR I had bought secondhand (what was I thinking?) snared the tape and actually somehow recorded SBS on about thirty seconds worth, even though the plugs weren’t covered. The videostore didn’t charge me, which was kind of them (already videos were on their way out) but I still didn’t get to see the rest of it. Then, last weekend my wife really wanted to see it, because it was about buildings and she works these days with buildings. People at work told her it was the film every project manager had to see. This time – in two installments – I watched the entire film. There is something comforting for me to enter the seventies, this world that existed just before I was born. The Towering Inferno has just about every star of its time in it; it’s sad to think of their fates 35 years later. Steve McQueen died in 1980 – what a shock that would have been, the action hero of his time; he seems indestructible as the fire chief in this film. The other lead, Paul Newman, died a reasonably old man this year. (How can the action star of a blockbuster turn into ‘a reasonably old man’?) Fred Astaire, dead of course; that woman who we thought was Elizabeth Taylor is actually Jennifer Jones, but she’s not dead, just 90 and not so remembered. Faye Dunaway – her beauty in this film looks like it will last forever, but she’s now in her sixties. Then there’s O.J. Simpson, who doesn’t appear in so many films these days. Richard Chamberlain? I remember him best as the Indiana Jones rip-off (or vice-versa, given how old the books are), Alan Quartermain, in the 1980s; his star doesn’t shine brightly these days either. I love the blinking lights of the computer; the wood panelling of the walls; the curious manner men speak to women – always trying to come up with a fresh line, as if that was the way to a woman’s heart. I love the strange sort of indolence that hangs over the scenes early in the film, the spacious sets they made, which just don’t ring true with what the interior of houses or hotels look like, not even in films today; the massive headphone radio the kid has over his ears so that he can’t hear what his mum is saying – ‘kids and their gadgets these days!’. I love the painted film posters they used to do. I imagined I was watching the film at the drive-in, taking it seriously (not that I’m taking it unseriously, but I’m not watching it as it was made, I’m not watching it as a blockbuster, as the latest, greatest thing, which is what it is always meant to be), I watched it like it was new, and in those moments I was time travelling. Some of JJ’s best roles (lead roles, as opposed to smaller roles) are in Madame Bovary (1949), The Barretts of Wimpole Street (1957), and Love is a Many-Splendored Thing (1955), which is based on the novel by Han Suyin. I’ve seen her in other films too but these were the most interesting. I am so ignorant of film pre-2000, basically! I didn’t know about JJ at all. IMDB noted that she stopped acting after Towering Inferno after one of her children killed themselves jumping from a tall buildling – if true, a terribly ironic thing.